New South Wales was the first British colony in Australia in 1788. It originally referred to the entire Eastern half of Australia. It was set up specifically to act as a penal colony. The British had previously used Georgia for this purpose in what was regarded at the time as an enlightened way of giving criminals a second chance. With the American Revolution, the British government had to consider alternatives. 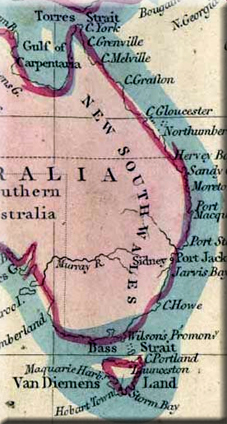 James Cook had mapped and claimed the area of New South Wales in 1770 and advised that it seemed to have a reasonable climate and sources of fresh water. Little mention was made of the aboriginal inhabitants who were thought to be too primitive and too sparse to cause any problems to colonisation. In 1788 Captain Arthur Phillip arrived with a fleet of 11 ships to try and carve out a colony with its unwilling cargo of passengers on the other side of the planet. It was originally intended that he would settle at Botany Bay but it did not offer a suitable anchorage nor a decent supply of water. He therefore explored for a better site and landed at Sydney cove which was a fine natural harbour that he named after the British home secretary. 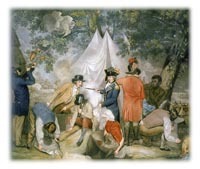 There were many challenges to be faced in establishing the colony. The wildlife was alien with many poisonous and unfamiliar insects and reptiles. The crops did not respond well to the hotter and drier conditions. The prisoners had little knowledge in agriculture or skills in carpentry or other useful trades. Worse was to follow as the poor diet led to scurvey and virtual starvation. The guards were struggling to survive themselves and showed little inclination to enforce discipline amongst the convicts. The challenges were considerable. Governor Phillip recognised that he was creating a new colony rather than an isolated prison camp. He therefore instituted a civil and legal code and a series of incentives to the prisoners so that they might earn their freedom through service to the colony. He appointed overseers from amongst the prisoners to get the other prisoners to do some work so that they might all have a chance to survive. In 1790 a second convict convoy arrived. It was hoped that they would provide a much needed boost in supplies and manpower. In reality, the convoy was diseased and on the point of starvation. It was a real disappointment to the colony. They were also infomred that the British Government intended to send two convoys per year after that and that the colony just had to cope. Governor Phillip had to send for supplies from India as it was the closest British colony at the time. He set up a new colony on Norfolk Island to try and provide an alternative food source. He attempted to diversify their economic and food sources through whaling and raising sheep. The settlement was still a very harsh environment but it was slowly carving out a colony from the harsh landscape that surrounded it. As the supply of convicts continued to grow, the power of the officer corps grew. They were disproportionately powerful compared to the convicts and had the pick of the best land and supplies. They would abuse this power in a number of ways as they tried to make at least something of this miserable posting. They created a monopoly over the supply of rum. This monopoly was so powerful that when the Governor tried to put a stop to it, they deposed him and set up their own military Junta for two years. This unfortunate governor was used to mutinies; he was Captain Bligh of Mutiny on the Bounty fame. Astonishingly the mutineers were not punished but the British did send out a new Governor to try and reign in the officers. He formalised some of Phillip's incentives for the prisoners and tried to create a public infrastructure that did not rely wholly on bars and alcohol. His lavish expenses would later be criticised, but he did begin to turn the colony into more than just a penal colony. Adventurers, retired servicemen, English Gentlemen would be attracted to the colony. They would join many freed prisoners. Technically, the prisoners, once they had completed their sentences, were free to return home to Britain. In reality, few of them could afford the fare back and so they ended up staying in the place of their incarceration. One irony for such a large colony was the lack of suitable space. The decent farming area around Sydney was quickly filled by these freedmen and new convict arrivals. Hemmed in by the Blue Mountain range and with few rivers or other sources of water being available, expeditions would be sent by sea and by land. 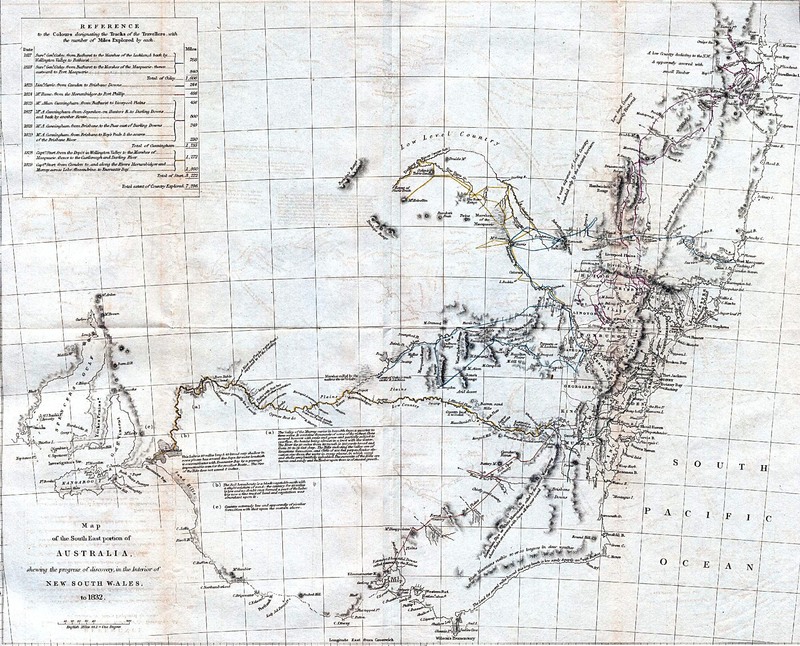 George Bass and Matthew Flinders would discover the more temperate island of Van Diemen's Land (Tasmania) in 1798. It would take much longer to traverse the mountain range. It was not until 1813 that they managed to cross the Blue Mountains. What they saw was a revelation. Mile after mile of lush grassland enough land for all the settlers and more besides. New South Wales was braced for a period of expansion. 1818 saw a significant adjustment in the British legal system when a lot of crimes that had been punishable by death were converted into transportation. The 1820s and 30s would see a rapid increase in convict traffic to the colony. Van Diemen's Land'a expansion was even more rapid. By 1824 it was clear that the population of this island needed its own administrative support especially as the 800 miles of sea were particularly treacherous. The first satellite colony grew out of New South Wales. 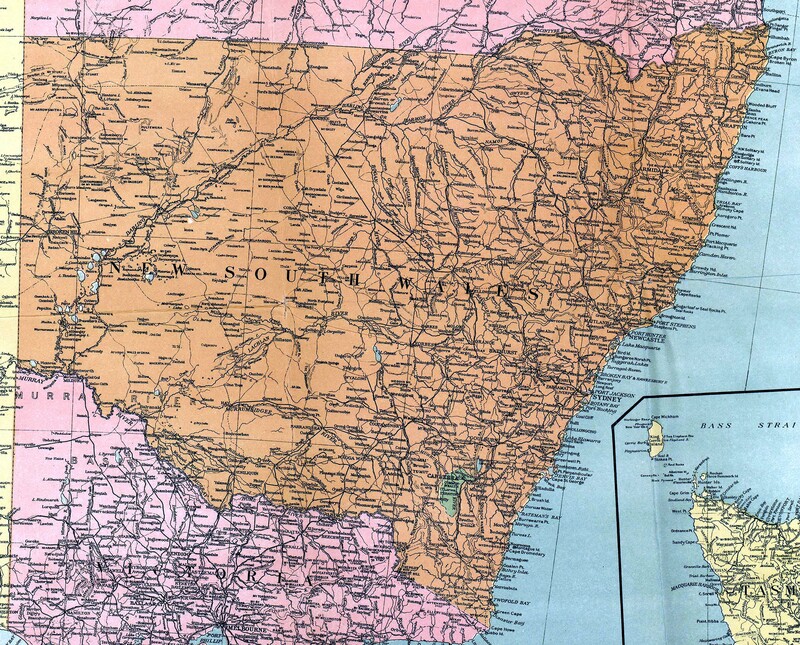 Over the course of the century, New South Wales would also be split into Victoria Colony in the South and Queensland Colony in the North. The flow of convict ships slowed in the 1840s. This was partly because of reforms in the penal system back in Britain were taking place. Additionalyy, religous reformers were concerned about some of the more indecent stories that filtered there way back to Britain about partners living in sin and children being born out of wedlock. There was some concern about the morality of institution of transportation. Besides, the colony itself was attracting enough freemen so that convict labour was no longer the essential item that it once had been. And freedmen generally worked harder and were bettern skilled than their convict associates. New South Wales correspondingly slowed down its requests for convicts - although other colonies continued to take them up until 1868. This increasing prosperity and population would lead to progress in the representation of the people. In 1842, the legislative council was changed so that only one third was appointed by the British Government. The other two thirds were elected - although with a restricted property based franchise. The experiment was such a success that it was extended to the other Australian colonies in 1850. New South Wales would remain a principally agricultural economy throughout the Nineteenth Century. Although it would diversify. The discovery of Gold in the colony led to a temporary growth spurt including a significant number of non-British colonists for the first time. New South Wales' economy would ultimately be boosted immeasurably thanks to technological developments of the Industrial Revolution. Steam powered ships cut the sailing times significantly, Railroads allowed crops and livestock to reach ports. And refrigerated ships would allow frozen food to be exported back to Britain and around the world. In the last half of the Nineteenth Century, New South Wales had 29 changes of government. This instability was generally due to the lack of established political parties. Most governments were temporary alignments of interested parties that were built on an ad hoc basis. Allegiances shifted rapidly but were recreated with a slightly modified personnel just as rapidly. 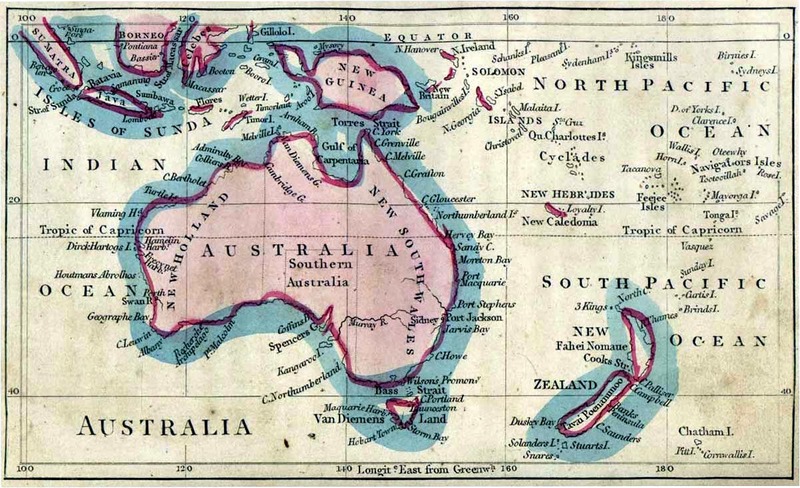 By the 1890s, Australians were beginning to consider themselves as part of a distinct island. Strategic concerns were becoming an issue as worldwide international tensions grew. The Germans, French and Americans were slowly claiming the islands of the Pacific. The Germans actually claimed some of New Guinea which was very close to Australia. It was felt that it was time to consider pooling their resources in a Federation but it was also an expression of early Australian nationalism. The British were eager to help share the costs and burden of defending the island and eagerly agreed to the request for self-government made to them in 1900.